This section describes getting started quickly and is intended for the experienced or impatient user. 1. 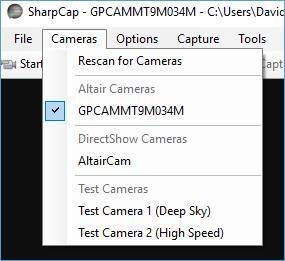 Download the latest camera driver from the manufacturer’s website. 2. Install the camera driver – there may be a need to approve an administrator prompt or run the installer as administrator. 5. Download the latest SharpCap from http://www.sharpcap.co.uk/sharpcap/downloads . 6. Install SharpCap – there may be a need to approve an administrator prompt or run the installer as administrator. 7. Go to the camera menu and select the camera from the list of devices. 8. If the camera is attached to a telescope or lens, a picture from the camera should be seen in the display area. 9. Use the Camera Control Panel at the right-hand side of the screen to control settings such as exposure and gain. The image should change in response to the controls being adjusted. 10. 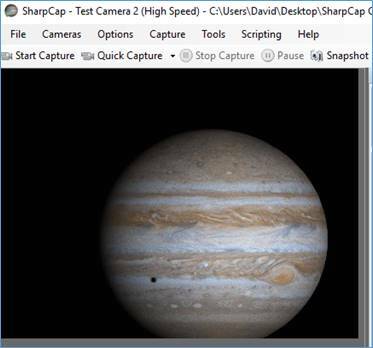 Use the Start Capture (or Quick Capture) buttons to start a video capture to a new file or the Snapshot button to capture a single frame to a file. Once the capture has completed, a Notification Bar will appear directly below the Tool Bar. Click the highlighted link to go directly to the folder holding the captured image. 11. The installation and testing of SharpCap is now complete.